O charme da Toscana, o gelo em uma fazenda, seis apartamentos, com piscina, em uma grande propriedade de 300 hectares. A colina da casa do gelo é cercado por bosques, com quilômetros de trilhas e grande manipulação. Tenuta Vallelunga é uma magnífica localização a poucos quilómetros de estradas principais, é um pulmão verde, onde na manhã você pode correr (mais de 10 km de trilhas na mata e no vale) e onde as crianças podem ser deixadas livres para galopando sobre passeios a cavalo no meio da fazenda, enquanto os pais relaxam na piscina da casa de gelo. Ou você pode querer começar a descobrir uma das cidades de arte que fizeram Toscana famoso no mundo em apenas dez minutos para chegar à auto-estrada. Relaxe, natureza e cultura juntos. A lareira é um grande apartamento no primeiro andar (90 metros quadrados). tectos em madeira, uma grande sala de estar com sofá-cama e uma sala de jantar, uma cozinha totalmente equipada com fogão quatro queimadores, forno, frigorífico e máquina de lavar louça. Dois quartos duplos, uma casa de banho com chuveiro, lavatório, bidé. Grande jardim com churrasqueira e mesas, piscina e espreguiçadeiras. Livre, ping pong, estacionamento gratuito ao ar livre, lavanderia com ferro / tábua de engomar e máquina de lavar. A casa está localizada a 15 km do aeroporto internacional e da estação de Pisa, a 10 km da estação ferroviária ea 8 km do porto de Livorno. A praia de Marina di Pisa é de 22 km de distância, Quercianella 24 km. São permitidos animais. Toalhas e roupa de cama incluídos no preço (para a roupa de cama não estão disponíveis). Berço e cadeira alta incluído no preço, sujeito à disponibilidade. Exterior: Grande jardim com piscina área cercada de 6 x 12 metros (1,40 m e 2,50 m de profundidade). Lavandaria. Churrasco. Jogos para crianças. Tênis de mesa. Nos 12 jours au sein de la Casa Ghiacci furent des plus agréables, champêtres, à 15 minutes en voiture du centre de Livourne et non loin des plages. Ce corps de ferme confortablement aménagé nous offrit tout le nécessaire pour profiter des journées ensoleillées à souhait... sans compter la piscine - quotidiennement entretenue - qui fit le bonheur de nos trois enfants. Matin piscine, après midi sieste, bains de mer jusqu'au soleil couchant... et ponctuellement la visite des villes alentours: Pise, Lucca, Florence, Sienne... plus captivantes les unes que les autres. Un grand merci à Giulietta pour nous avoir proposer ce pied à terre dans "la plus belle région d'Italie". C'etait un plaisir avoir Anne son mari et ses garçons chez nous. Toujours gentils, sympatiques et ils ont bien traités la maison. Donc nous les remerçions pour leur choix et nous esperons les revoir! Lovely setting on a beautiful rural estate. We thoroughly enjoyed our stay at Casa Ghiachi. Lovely secluded location on a rural estate with good facilities. The accommodation was clean and functional and our hosts made us feel like part of the family from the moment we arrived. Easy access to many of the popular tourist locations and our hosts gave us good information for visiting places of interest in the area. Plenty of room for children to play safely outside and a very clean and well maintained swimming pool. We would certainly recommend this to others. It's been a pleasure to host Matthew, Priscilla and their lovely daughter Annabelle. They have been perfect guest, punctual, respectful of the house, easy going and always extremely kind. We would love to host them again and we recommend them to any other host. Wonderful stay at casa ghiacci "La Rosa"
thank you very much for our great vacation this summer. The communication was very good, friendly and courteous. The apartment was clean and everything necessary was in there. Small repairs were down quickly. Staff was very friendly and helpful. Apartment / Interieur corresponds with the description. Everything was fine and we enjoyed our stay. Dear Simone, thank you for your appreciation of our apartment and our property. It is always a pleasure to host families like yours, since our place is peaceful and safe for children as you may have seen. We pride in hosting families and offer them a relaxing and fun experience responding to their needs as quick and completely as possible! I went to Tenuta Valle Lunga with my Mum. Our first holday away together. Giulietta and her lovely family were so helpful as we had never travelled so far alone before. The farm house is stunningly rustic. Very clean and simple and super spacious. There was easiy room for 4 in our appartment. A lovely pool that was a welcome cooling off facility, much needed in August! We had the most relaxing holiday ever. Driving and exploring during the day, sitting by the pool early evening, back into the appartement to make tea and then a walk through the extensive fields and path ways before bed. thank you for your comment! we were really happy to meet you and your lovely mother and we are looking forward to having the opportunity to welcome you again by us and show you even more of our neighbourhood! Our family stayed one week at the "Il Forno" apartment at Casa Ghiacci. The apartment was very spacious for the 4 of us. While the accomodation is rustic, all is clean and well-kept. The apartment offered us a good level of simple comfort. 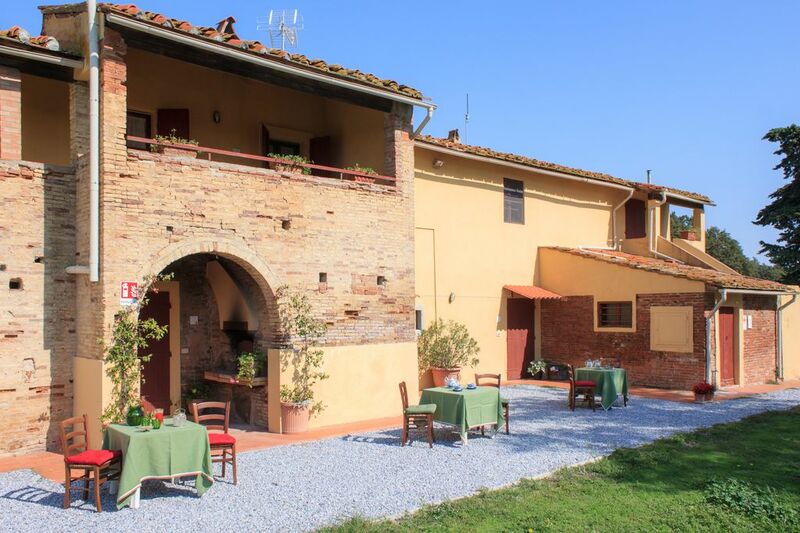 The surroundings of Casa Ghiacci are quiet and nice with lots of woodland and plain nature. The swimming pool is a good thing as temperatures went up strongly. Our two children made quicky friends with the other guests' children. Our daughter enjoyend very much the ranch. During our stay she followed a training at Vallelunga's ranch. Our son tried fishing in the 5 ha. lake at Vallelunge - but no fish. We'll keep on trying more. Giulietta is friendly, and above all, very helpful host. She has good advice for activities, sightseeing and nearby restaurants. We enjoyed very much our stay and we'll be back ! thank you for your positive comment. Each comment we receive helps us improve our guests reception. Hoping to be able to welcome you and your very nice family again by us. Our apartments are described in details and clearly to our guests both on our website and on this site. Description thoroughly corresponds to the apartment rented as shown by our other guests reviews here. Communication is essential for us and we put special care in sending our guests all infos to reach us and the contacts to get in touch with us as we did with this guest too. The reception in the property welcome guests who are many hours late on their estimated time as this guest was. Unfortunately this guest did not give us the chance to know why he decided to leave the house after having reached it. The other guests reported that he left the house although he was clearly told in his mother tongue where to check in at the reception (only 1,5 km far from the house and clearly indicated by signboard in the property) where we were waiting for him. We were very sorry that this guest did not check in nor gave us his mobile number or phoned us once at the house. We always ask our guests to provide a phone number in case some unexpected event occurs. We also publish on our website a contact emergency number. We were very sorry to find out that this guest’s intention was to express a negative judgement even before we could show him the rented flat. We could only regret his decision and wish him a safe trip . - degustação de vinhos no bairro e visita privada à fortaleza Brunelleschi na cidade medieval de Vicopisano. - escola de equitação para crianças e adultos na propriedade. - 12 km de bicicleta e pista de jogging na propriedade. Livorno (8 km) e Livorno Harbor. Ferries para Capraia, Gorgona e Elba. Sul: Populonia (local etrusca), Bolgheri, Castagneto Carducci, Punta Ala, Castiglione della Pescaia.